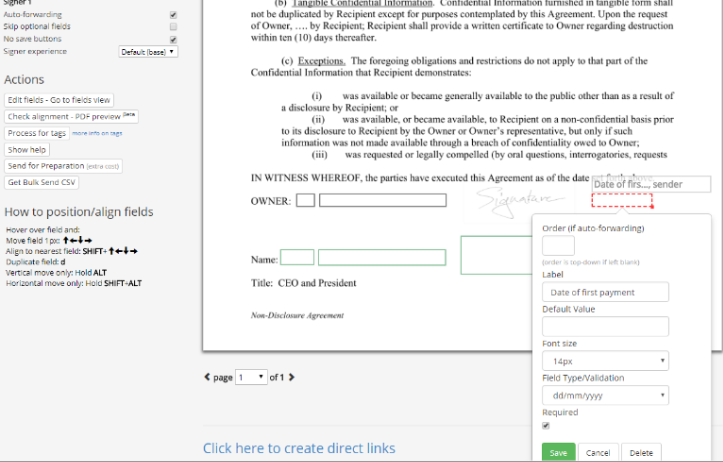 All form fields on Legalesign can be made optional or required. When you add either a signer field or a sender field a form pops up with all that fields settings. You will see a 'required' tickbox just above the save button. When editing fields, rather than mousing down to the save button every time you want to save the field settings, just press the tab key. To access the form for an existing field just double click on the field. To review all your fields in a tabular format click 'Actions' on the left to open up the submenu, and then 'Fields View'. This page lists all your fields and you can rapidly change multiple fields without having to click through page by page.